Textile and garment is the industry that benefits most when the Comprehensive and Progressive Agreement for Trans-Pacific Partnership (CPTPP) and the Vietnam-EU Free Trade Agreement (EVFTA) officially come into effect, said experts at the seminar "CPTPP and EVFTA - Implications for Vietnam Textile and Garment Industry". They also noted that businesses in the industry should actively capture and exploit advantage of these FTAs, especially tariff preferences. At the seminar, organised by the Ministry of Industry and Trade (MoIT) and the Vietnam Textile and Apparel Association (VITAS) in Ho Chi Minh City, Mr Vuong Duc Anh, representative of the Import-Export Department, MoIT, informed garment & textile businesses of the roadmap for signing and implementing the CPTPP and EVFTA. Specifically, the EVFTA was finalised by 2015, and is expected to be signed by the end of 2018 and ratified by the European Parliament in March 2019. The CPTPP was signed on March 9, 2018 in Chile and will be officially put into practice by the end of 2018. When EVFTA and CPTPP officially enter into force, opportunities for Vietnam's textile and apparel industry will be wide open. Textile and garment enterprises are supposed to grasp and take advantage of these FTAs. By taking advantage of FTAs, Vietnam's textile and garment industry has the opportunity to increase its export turnover as well as its added value. However, Mr Vuong Duc Anh noted that in order to benefit from these FTAs, Vietnamese garment & textile enterprises should understand the benefits and commitments under the two agreements. In addition to being nimble and proactive in accessing new markets, enterprises also need to pay attention to meeting the origin requirements and ensure the quality control process throughout the production process. "If businesses capture and utilise the advantages of CPTPP and EVFTA, the export turnover of Vietnamese garment & textile will grow even stronger in such potential markets as Canada, Japan and EU," said Anh. Mr Vu Duc Giang, Chairman of VITAS said that despite not yet being effective, both the CPTPP and EVFTA have made Vietnam textile and garment industry very attractive to domestic and especially international investors. As evidenced by the first half of 2018, Vietnam garment and textile industry has attracted a total of US$2.8 billion of FDI, bringing its total FDI investment to US$17.5 billion with more than 2,000 FDI investors coming from 16 countries and territories in the world. Together with increasing investment attraction, CPTPP and EVFTA has significantly contributed to changing the structure of foreign markets of Vietnam’s textile & garment with many new potential markets such as Canada, Australia, and New Zealand. Previously, these countries were only interested in Chinese textile products. Nowadays, many companies in these countries have turned to Vietnam for big-sized orders. 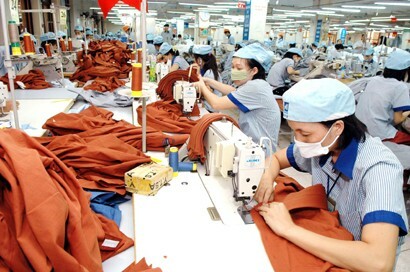 "The trend of shifting production and transferring orders of foreign buyers not only creates more opportunities for domestic companies to diversify their export markets, but also motivates them to invest in the production of textile and garment materials in Vietnam, to gradually fill supply of raw materials and accessories,” added Mr Giang. In order to take advantage of the tariff preferences of CPTPP and EVFTA, enterprises themselves should apply thoroughly the provisions on rules of origin under the agreements, especially the yarn-forward rules. Confirming the rules of origin of CPTPP and EVFTA are very strict, while the capacity to meet the requirements of rules of origin of enterprises in Vietnam is very limited, he also said that overcoming this weakness requires enterprises to grasp the regulations for textiles and garment as well as the roadmap for tax reduction in the agreements; enterprises need to pay attention to training and updating regulations on certificates of origin. VITAS is actively working with the Ministry of Industry and Trade to select prestigious textile and garment enterprises that can carry out self-certification of origin in the coming time to take full advantage of the preferential tariffs that CPTPP and EVFTA provide.